Feed bridging has become a common event in the swine industry as feed rations change due to fluctuating input costs and the use of alternative feed stuffs to lower cost and gain feed efficiency. The “Flow Hammer” is a reliable and affordable solution that easily adapts to most existing feed bins. This patent pending product aids in the prevention of out of feed events in all phases of swine production. Control unit can be remotely mounted or tank mounted with optional leg bracket. 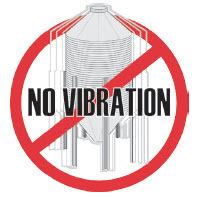 While high frequency vibration devices are effective in promoting feed flow, their use can result in loosened hardware and metal fatigue potentially resulting in structure failure. The Flow Hammer’s low frequency/high impact design promotes feed flow without damaging your feed bin or voiding it’s warranty. 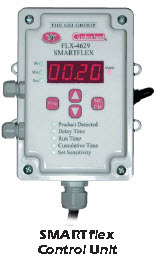 The SMARTflex control unit uses a proximity sensor and timers to efficiently operate a Flex-Flo delivery system. The SMARTflex comes with digital display and push button programming for ease of operation. Drag me with a mouse! 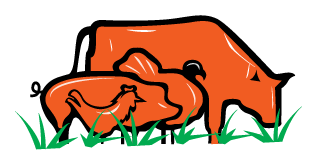 Walbern Agri-systems is an equipment dealership that serves the poultry (broilers, layers, turkeys), hog and dairy industry. We employ five full time and two part-time people. Further to this, two men on our sales team bring along 30 years of first hand experience as they ran their own farms for 15 years each.